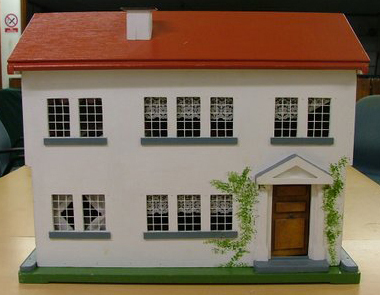 This beautiful, limited edition (Number 15 of 20) doll’s house has been very kindly donated to Beat SCAD by Arthur and Vera Askew of Melton Mowbray to help raise funds for the vital research needed into Spontaneous Coronary Artery Dissection (SCAD). 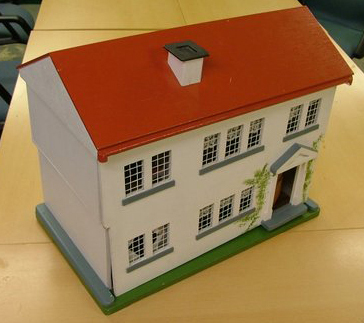 The house will be auctioned at the Melton and District Model Club open weekend on 10-11 September. A sealed bid auction will be held at the Beat SCAD stand, where the house will also be on display. Beat SCAD is the nominated charity for the open weekend – see our news story for more details. 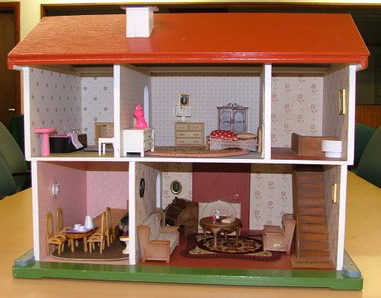 Vera is an avid doll’s house collector and has spent many hours carefully furnishing this enchanting home, adding further character to its already interesting history. Vera has owned the house since 1977 after purchasing it from the much loved F. H. Watts Toy Shop on Sherrard Street, Melton Mowbray. Frederick and Hilda Watts started the business just after the Second World War and enjoyed a long and successful reign with their family as Melton’s favourite toy shop – including a merger to become Arbon & Watts. This two storey house comprises four rooms assembled as lounge room and kitchen/diner downstairs, bedroom leading off stair hallway upstairs plus bathroom. The paint work is original – the house has never been re-painted or altered. For more details and information about how to submit your bid, please download this pdf.